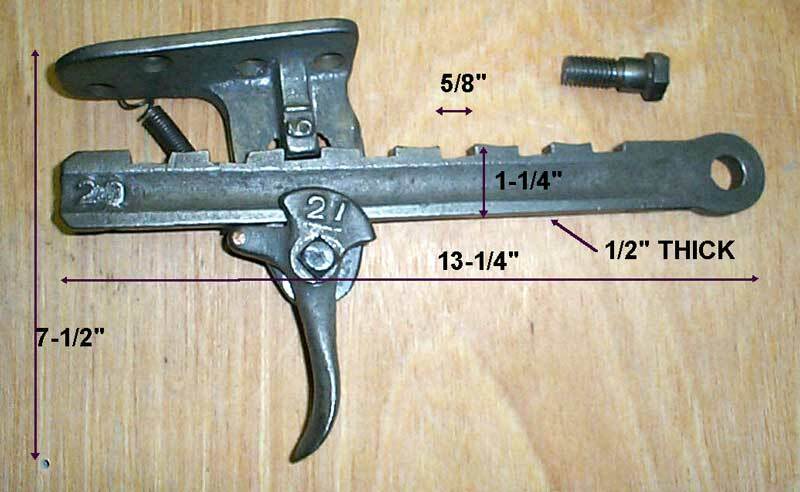 Vise Dogs - Sometimes called auxiliary jaws. Vise Dogs Pins - Used to engage or raise vise dogs. The casting numbers are used to distinguish the various parts and to aid in assembly. The original sales literature mentions 7 pairs of vise jaws. It says "It has seven pairs of jaws so that it is adapted to grasp any kind of work without regard to irregularities of form." Wow, that's some vise, 7 pair. When I first read this, I thought that there must have been a lot of missing parts from my Emmert vise. That is not really the case though. Here is a breakdown of these vise jaws and jaw inserts. The main vise jaws (one pair) measure 7 x 18.5 inches. These have button-hole or key-hole openings which can hold wood pads or jaw insert. One pair of steel faced jaws are located on the underside of the main vise jaws. These are used to hold metal objects, pipes or smaller objects. Two pair of small auxiliary jaws (1" wide) extend from the main jaws. These are commonly called vise dogs. A taper jaw insert can be used to hold tapered table legs and the like. This is often missing from the vise but can be purchased from Patrick Leach. Now the last 2 pairs are where it gets a little tricky. Rotate your Emmert 90 degrees to the workbench. "Ta Da", now you have a 7" wide pair of jaws above the beam and a 7" wide pair of jaws below the beam. Now you know how to get 7 pairs of jaws out of one Emmert. These are sometimes called the drag or bar. The Tilt Adjustment Mechanism consists of a tilt adj. rod, tilt adj. handle, tilt adj. clamp and a tilt adj. bracket. Type TA1 – Tilt Adjustment Rod is a Flat bar with notches. This rare tilt adjustment mechanism has 7 preset lock points. The handle has a spring attached. It obviously is more costly to manufacture than the TA2 that replaced it. Type TA2 – Tilt Adjustment Rod is a Round bar which is usually broken or cracked where this one is. The bar is 12" total length, 3/4" dia. and is connected to the hub by a hex head bolt. The Tilt Adj. Bracket mounts to the bench with 5 large wood screws. The ones I've seen do not have a casing number on the bracket. The bracket height is low, only 2-1/2" from bench to the pivot point. The Tilt Adj. Handle has a large gentle curve, is 5" long and has no casting number. It connects to the bracket with square head bolts. Type TA3 – Tilt Adjustment Rod is a Flat slotted bar. The bar is 15" long, 1/4" thick and the hole at one end attaches to the hub of the vise. The Tilt Adj. Bracket mounts to the bench with 4 wood screws. Some brackets have a casting number of K4 and some do not. The bracket is taller being 5" from bench to the pivot point. The Tilt Adj. Handle is straight and is 5" long. The handle casting number may be K6 or none at all. The older handles connect to the bracket with square head bolt and the newer handles connect with a hex head bolt. Type TA4 – Tilt Adjustment Rod is a Flat solid bar. The bar is 15" long, 1/4" thick and the hole at one end attaches to the hub of the vise. The Tilt Adj. Bracket mounts to the bench with 4 wood screws. 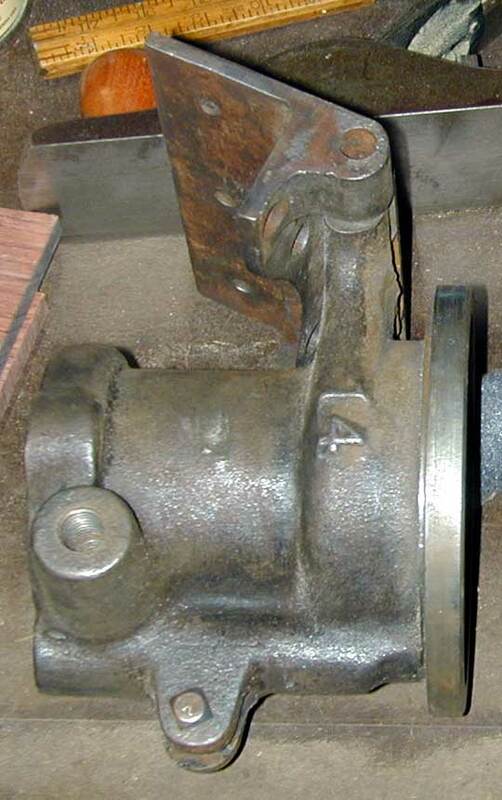 Some brackets have a casting number of K44. The bracket is taller being 5-1/4" from bench to the pivot point. The bar slides thru a square hole with a threaded bolt cast in. The Tilt Adj. Handle is a 5" straight handle. 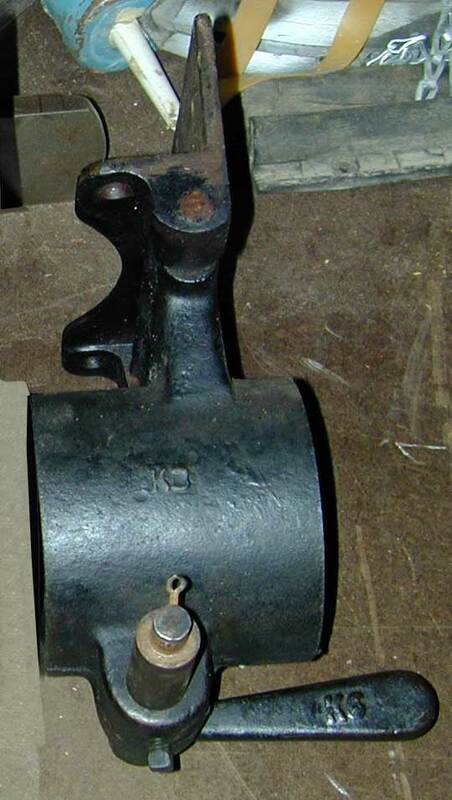 The handle casting number may be K64. The handle connects to the bracket with double hex nuts. Note: If the bench thickness is over 2", then the adjustment bar may bind unless the bracket is recessed as shown here. 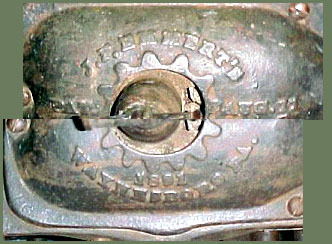 Cover C1 - Gear symbol around spindle hole, and J. F. Emmert's arched on above, Pat. Aug. 11 in middle and 1891 Waynesboro PA. arched below. Cover C2 - Emmert's arched over spindle hole, and Pat. Aug. 11 91. Logo C3 - Emmert's Pat. Aug 11, 1891 & Apr. 11, '05. Some have USA below spindle hole and other do not. Logo C4 - Emmert's straight over spindle hole, and Pat. Aug. 11 (1891 missing or scratched off mold). Below spindle hole is Apr. 11, 05. 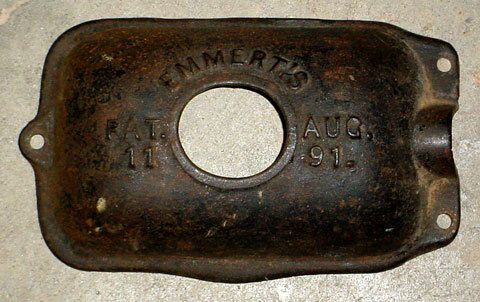 Logo C5 - Emmert Mfg. 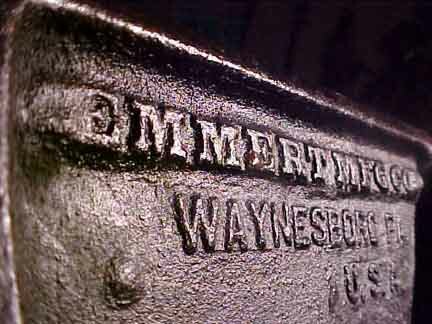 Co. Waynesboro (arched) PA.
Turtleback Logo 3.7 - Emmert Mfg. Co. Waynesboro (arched) PA.
K1 Logo 5 - Emmert Mfg. Co. (extra high raised lettering) Waynesboro PA U.S.A. and Patented. K1 Logo 6 - Emmert Mfg. Co. Waynesboro PA U.S.A. and Patented. K1 Logo 7 - Emmert Mfg Co on left side and K-1 Waynesboro PA USA on right side. Some have a N cast below the 14 and some do not. Hub 2 on the left and Hub 3 on the right. 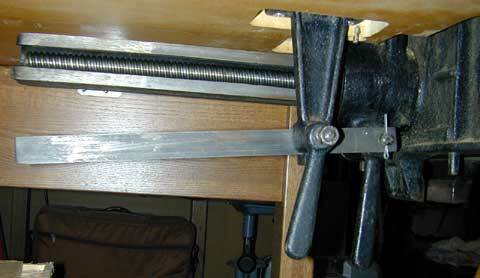 The gap in the hub is used to clamp the rear jaw and lock the vise rotation. Hub 2 on the right and Hub 3 on the left.